At the moment things are not completely tickety boo chez bead towers, nothing dire but a fairly unimpressive array of minor irritants and stresses. These last couple of weeks I have been a bit anxious and generally more tetchy than usual. In April I will be at Bead Magazines Big Bead Show so I thought a useful tactic would be to turn the burner up and concentrate on actually making some beads for the show. I still have nearly two months so the pressure isn't on yet and I was feeling really chuffed with myself for being so well organised for once - ha! I have made a lot of beads over the last week or so, there are some nice colour choices that I am pleased with, they are even and neat but they all have one flaw..one dodgy end, not sharp and pointy but rough enough to ensure they will never see the light of day. I know I'm a perfectionist but these things really matter to me and it really galls me to have wasted so much glass and time and made such a basic mistake.. over and over again, several days in a row! Here is the thing though, it almost perfectly matches my mood, not in a total funk or anything major but just a little bit crap. 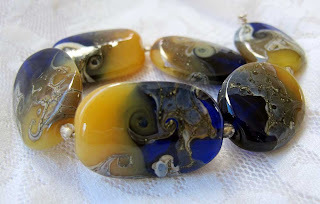 So I am taking the weekend to catch up with the general shenanigins, let my head stop churning and maybe, come Monday I will be able to make a decent bead..that's the plan at least.